Image 1 of 12: The swimming pool with expansive deck is the core feature of Winedown Villa. 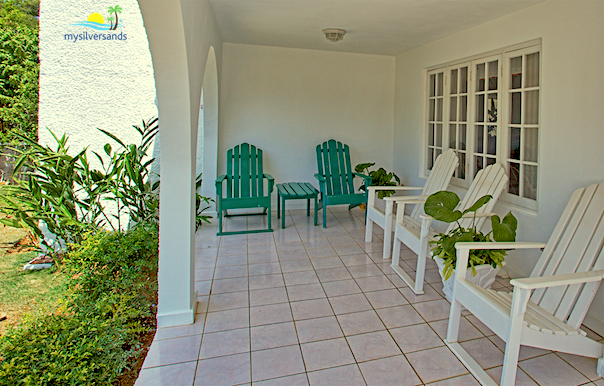 2 of 12: There is a comfortable seating area in a shaded porch beside the swimming pool. 3 of 12: Sunken Living Room and Dining Room. 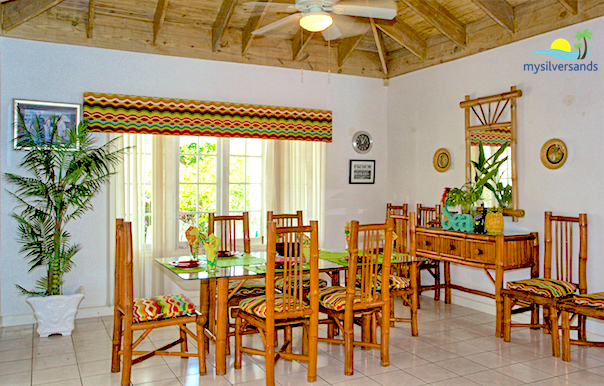 4 of 12: Tropical-style bamboo dining table and chairs. 5 of 12: The spiral staircase beside the swimming pool leads to the rooftop sundeck, where there are lounge chairs and dining facilities. 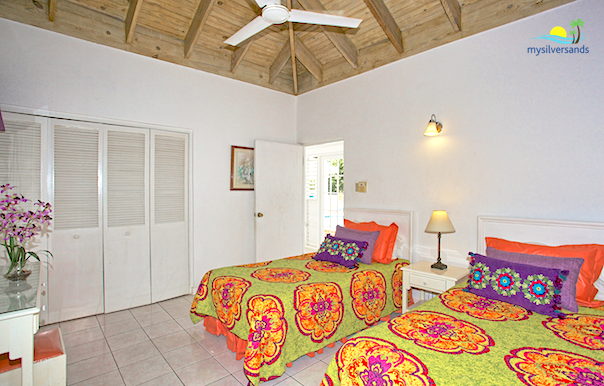 6 of 12: The Master Bedroom is furnished with two double beds. 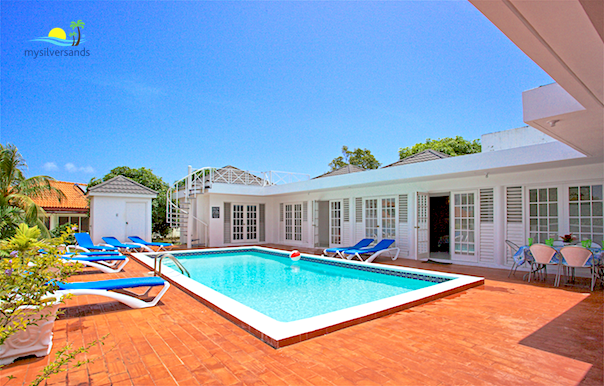 Look through the double doors for a view of the swimming pool. 7 of 12: Bedroom Two is furnished with twin beds. It opens out to the corridor which lines the swimming pool area. 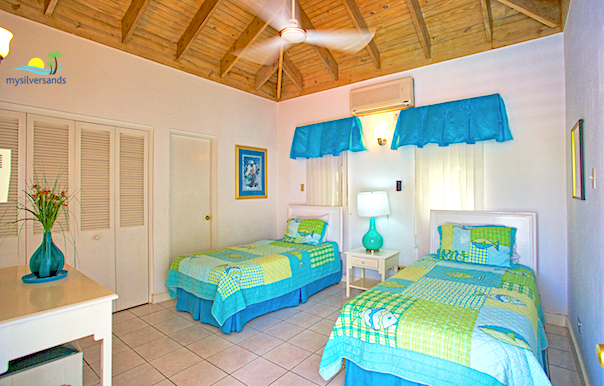 8 of 12: Bedroom Three is furnished with twin beds. 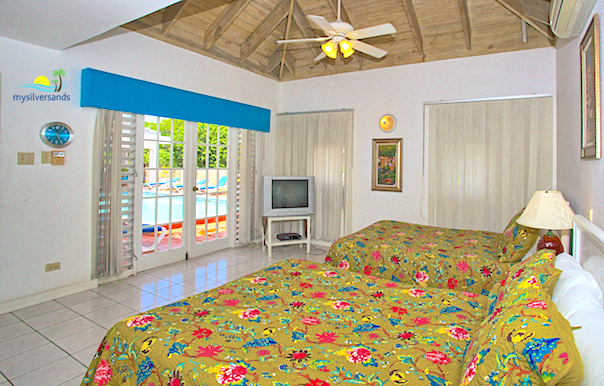 9 of 12: Bedroom Four is furnished with two double beds. 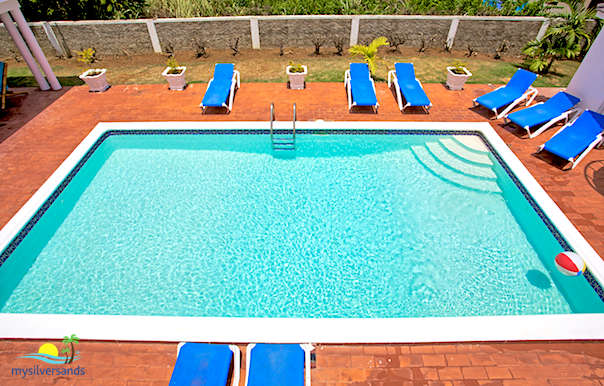 10 of 12: View of the swimming pool from the rooftop sundeck. 11 of 12: The Verandah at the entrance to Winedown Villa. 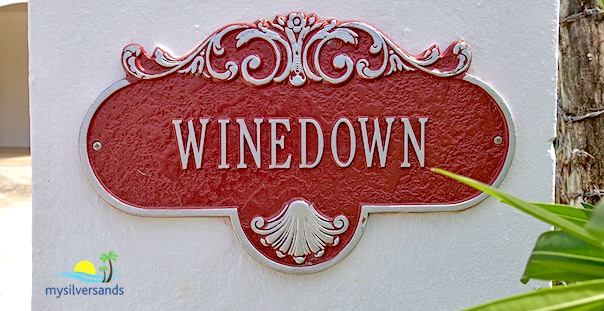 12 of 12: Look for the Winedown sign on the gate column at the entrance. 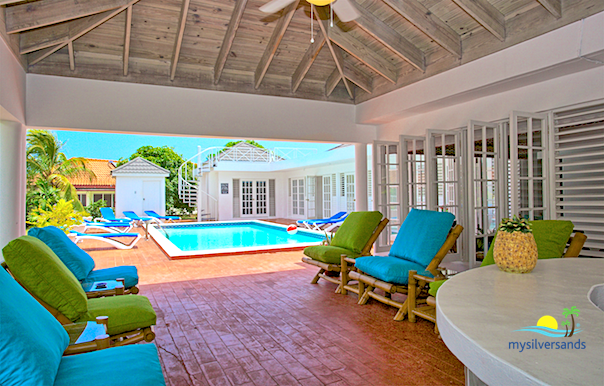 Winedown Villa is a four bedroom, four and a half bathroom villa vacation rental located near to the beach at Silver Sands on Jamaica's fabulous North Coast. The bedrooms and living room of this spacious villa open out to a private swimming pool with sunny deck and covered porch. There is also a roof top sun deck. Winedown is perfect for families and friends who want to enjoy Silver Sands and the nearby visitor attractions on the North Coast of Jamaica. Beside the swimming pool there is a spacious shaded porch/patio with bar. 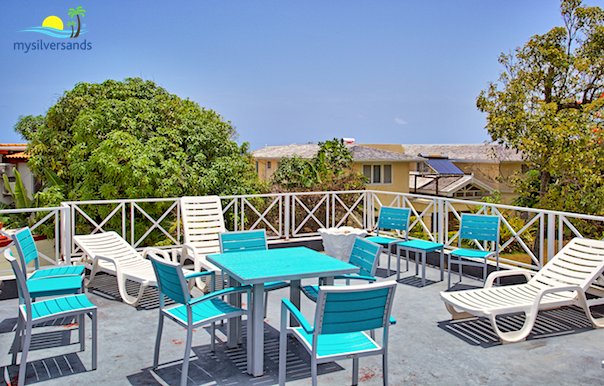 Rooftop deck with tables and chairs. Indoor and outdoor dining facilities. 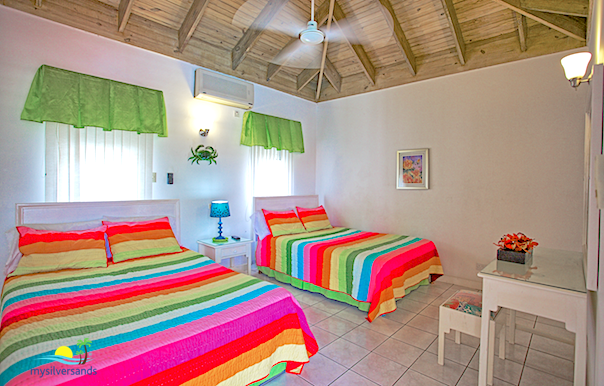 Every bedroom is screened, air-conditioned and equipped with ceiling fans. Sunken living room with view of the swimming pool through French windows. Verandah at the entrance to the villa. Cable television, DVD player, stereo with CD player, Telephone. Free wireless high speed internet access. Fully equipped kitchen with cook and housekeeper working flexible 8 hour shifts. 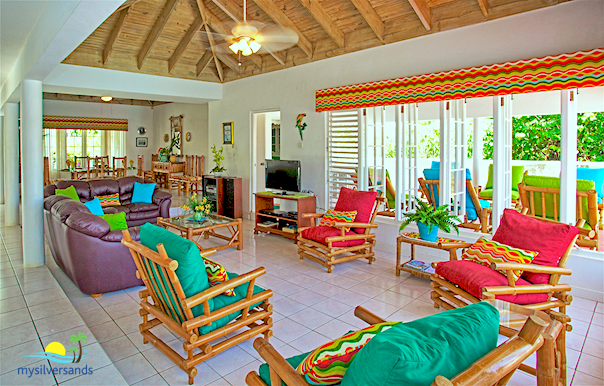 Winedown Villa costs from $227.00 to $384.00 per night.